I just received this email from one of my Japanese friends. On March 11, at 2:46 PM (JST), Tohoku earthquake cut 500 km of land and Kantou area, a half of Honshu island of Japan. This strong earthquake with a magnitude of 9.0 on the Richter scale and caused tsunami. In Tohoku area, the big earthquake was thought not to happen, while magnitude of 8 on the Richter scale will happen in Tokai and Kantou area during the next three decades. It might be that the unexpected tsunami kills all the emergency electric generators by soaking it in water or carrying away their oil tanks. As the results, Fukushima Daiichi, Unit 1st, Unit 3rd, and today Unit 2nd lost cooling capability after exhausting battery. Probably some fuels melted and high temperature interaction of zircaloy and steam hydrogen. Hydrogen explosion happened at turbine buildings in Unit 1st and Unit 3rd. Today on March 15 also in the Unit 2 it happened, and this hydrogen explosion attacks and hurts the containment vessel. 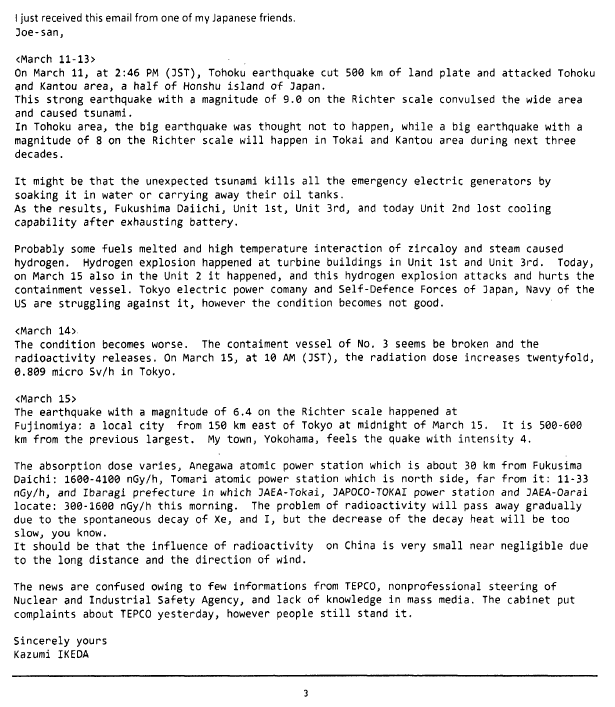 Tokyo electric power comany and Self-Defence Forces of Japan, Navy of the US are struggling against it, however the condition becomes not good. The condition becomes worse. The contaiment vessel of No. 3 seems be broken and the radioactivity releases. On March 15, at 10 AM (JST), the radiation dose increases twentyfold, 0.809 micro Sv/h in Tokyo. The earthquake with a magnitude of 6.4 on the Richter scale happened at Fujinomiya: a local city from 150 km east of Tokyo at midnight of March 15. It is 500-600 km from the previous largest. My town, Yokohama, feels the quake with intensity 4. The absorption dose varies, Anegawa atomic power station which is about 30 km from Fukusima Daichi: 1600-4100 nGy/h, Tomari atomic power station which is north side, far from it: 11-33 nGy/h, and Ibaragi prefecture in which JAEA-Tokai, JAPOCO-TOKAI power station and JAEA-Oarai locate: 300-1600 nGy/h this morning. The problem of radioactivity will pass away gradually due to the spontaneous decay of Xe, and I, but the decrease of the decay heat will be too slow, you know. It should be that the influence of radioactivity on China is very small near negligible due to the long distance and the direction of wind. The news are confused owing to few informations from TEPCO, nonprofessional steering of Nuclear and Industrial Safety Agency, and lack of knowledge in mass media. The cabinet put complaints about TEPCO yesterday, however people still stand it.